The instanceof operator in Java is used to check if an object belongs to a particular type or not at runtime. It's also a built-in keyword in Java programming language and mostly used to avoid ClassCastException in Java. It is used as safety-check before casting any object into a certain type. This operator has a form of object instanceof Type and returns true if the object satisfies IS-A relationship with the Type i.e. object is an instance of class Type or object is the instance of a class which extends Type or object is an instance of a class which implements interface Type. Once an object passed the instanceof check, it's safe to type-cast into that type, without worrying of java.lang.ClassCastException. By the way instanceof operator is also a rather lesser used operator in Java, similar to transient and volatile, and many programmers don't even know basics of this operator. If you are one of those then you must read this article and bookmark it for future reference. Good knowledge of instanceof operator is essential for Java developers, but It's, even more, important for those JEE developers, who are working in Hibernate, as instanceof has a big role to play in overriding equals() and hashCode() of Hibernate persistent class. Since Hibernate proxies everything, it's not possible to use the getClass() method for type checking, you need to rely on instanceof operator for that. You can also expect few questions from instanceof operator in OCPJP exam or any core Java interview. 1) instanceof operator will return false if the object is null. For example in the following code, control will not go inside if() block if object's value is null. You can use this property of instanceof operator while overriding equals() method in Java. 2) The instanceof operator is primarily used to check whether an object is of a certain type or not. In fact, the instanceof operator provides a way to perform runtime type identification in Java, which is unlike C++, not supported by Java. Alternatively, you can also use the getClass() method from java.lang.Class for the same purpose. See the article 2 ways of runtime type identification in Java for more details. Since instanceof operator in Java returns true for instance of a subclass, this code will work fine with Hibernate proxy classes, which inherit from the persistent class. By the way, instanceof check also breaks equals() method's symmetrical contract, according to that if a.equals(b) is true than b.equals(a) should also be true, but with the instanceof operator in use, if a represent instance of parent class, and b being instance of child class, a.equals(b) will return true but b.equals(a) will return false, thus breaking equals() contract of symmetry. Though it's not a real issue, until you are doing such comparison e.g. in the Hibernate persistent class. Here is a sample Java Program to demonstrate the capability of instanceof operator in Java. First we have created a couple of classes and interfaces to define type hierarchy. We have a class called ObjectOriented and an interface JVMLanguage. Then we have another class called Java which extends ObjectOriented and implements JVMLanguage and another class called CPlusPlus which only extends the ObjectOriented class. Now with this setup, we will test the instanceof operator to determine whether an object is an instance of any of these classes or not. System.out.println("oops instanceof ObjectOriented : "
System.out.println("java instanceof ObjectOriented : "
System.out.println("java instanceof JVMLanguage : "
System.out.println("cpp instanceof ObjectOriented : "
System.out.println("oops  instanceof Java : "
System.out.println("oops  instanceof JVMLanguage : "
System.out.println("cpp instanceof JVMLanguage : "
System.out.println("(java =null) instanceof ObjectOriented : "
System.out.println("(java =null) instanceof Java : "
You can also run this program by uncommenting certain code which fails instanceof check and subsequent cast will throw java.lang.ClassCastException. This program is self-explanatory, but you should pay attention when instanceof return false, you can clearly see that it returns true only when we have IS-A relationship satisfied between A and B in check of A instanceof B. If A is null or there is no IS-A relationship, it will return false and any attempt to cast B into A will throw ClassCastException. 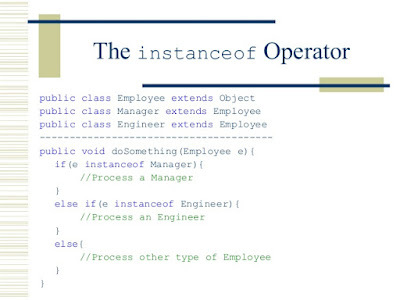 That’s all about what is the instanceof operator in Java and how to use instanceof operator. In defensive programming, instanceof check is must before casting any unknown object. By default don't use the instanceof operator for type checking in equals(), as it breaks the symmetry contract, but remember to use it while overriding equals() for Hibernate persistent class. @Walter, that's right, thanks for pointing it out. I have corrected it now.